The Scottish Premier League has told the Scottish Football League clubs gathering at Hampden that they have no problem with a 12-12-10-10 set-up. On Monday, , possibly for next season. With some SFL clubs fearing an 18-team tier would create too many meaningless matches, a new plan has emerged. It would involve expanding the number of senior clubs by two to 44. The 30 SFL clubs have discussed the options at their meeting at the national stadium in Glasgow but a formal vote did not take place. Instead, a vote by 29 of the clubs - Rangers, as an associate member, do not have a vote - will most likely take place in March, with 75% needing to agree to the proposal for it to be ratified. 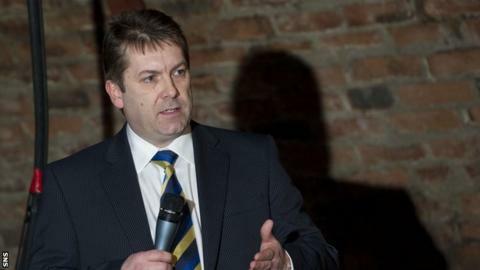 "There was a distinct mood that we still are keen on a full 42-club solution to take the game forward and that's what we got," said SFL chief executive David Longmuir after Thursday's meeting. "We were talking principles - one league body, pyramid, governance, distribution - and it was a very good meeting. "All 30 clubs gave their indication that they wish us to take the meeting and the detail forward now, so that's what we'll do. We'll look at the combined rulebook. "We'll need to bring it back in a more formal package to the 30 club and allow them to make a much more informed decision. "Any change is deliverable if there is a will and a consensus. We want to see an improvement in the game. "Whether or not it is achievable for next year is another matter and that will be determined by what we can do over the next few weeks and months." The SPL says it had suggested a 12-12-10-10 formation to the SFL board but that its member clubs had preferred a three-tier plan. Earlier, in mid-November, the SFL clubs had unanimously voted for a 16-10-16 structure for season 2014-15. Of course, if the 12-12-10-10 format is backed by the SFL clubs, then there will be five tiers in Scottish football once the bottom four of the top tier and the top four of the second tier form a mini-league after 22 matches in their respective divisions. There would be play-offs between the third and fourth tiers but it is not yet known what the movement of teams would be between the second and third tiers. Also, the clubs would have to decide how they will add two more clubs to the ranks of the proposed new league that will be run by one body, following a merger of the SPL and SFL. For example, will certain clubs be invited to apply, or will there be a general call for applications? Ross County and the two teams that formed to create Inverness Caledonian Thistle emerged from the Highland League when the leagues were restructured in the 1990s and that league may provide a new recruit. Similarly, the East of Scotland Football League, featuring teams such as Spartans and Edinburgh City, may have clubs interested in switching divisions. A 12-12-10-10 set-up may suit Rangers, who currently enjoy a 20-point lead in the Third Division. They were angered by the suggestion that they could win the league title but still find themselves playing the same teams next season as they have faced in the current campaign. Follow Brian McLauchlin and Chris McLaughlin on Twitter.